Deli has been around for quite some time but hasn’t really caught the fancy of the Zamzama hopping eataholics. One reason could be its obscure location, nestled between two non-descript shops in an equally non-descript by-lane of Zamzama. They say the best location to open a shop is right across the road from your competitor. Unfortunately for Deli, there’s a wall in front of it. Another thing not going in its favor is the absence of other eateries in that lane. So it’s a big disadvantage alright. However, Deli hasn’t done anything on other fronts either to offset this disadvantage. It’s not keen on marketing which is evident from the fact that they haven’t been seen either on the print or other media. Hell, they don’t have a presence online, a place which their target market frequents and can be used virtually for free if you know your way around the cyberspace. 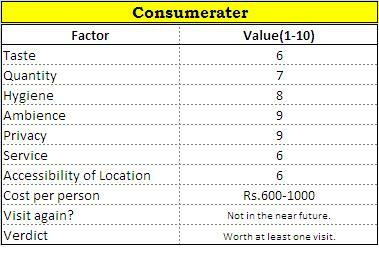 The absence in the mainstream media, however, is understandable given the exorbitant rates and the below average response courtesy the brand clutter. It’s a double-storey restaurant and that’s all the more reason for it to indulge in some sort of marketing activity because when we visited the place, it was mostly deserted. Of course it won’t be able to afford a print or electronic ad in the mainstream media nor would it be that much effective. However, it can definitely do with at least a Facebook and twitter presence where it keeps its followers and fans abreast of the latest offerings. It doesn’t cost a dime to do this. And there should definitely be special offers specifically for those days which are the slowest. Gun Smoke has a limited Eat All You Can deal for Mondays, which they perceive to be their slowest day. The service wasn’t up to the mark. Of course, the waiters were polite and courteous, but then they are at all restaurants, great and small. It’s the little things that count. 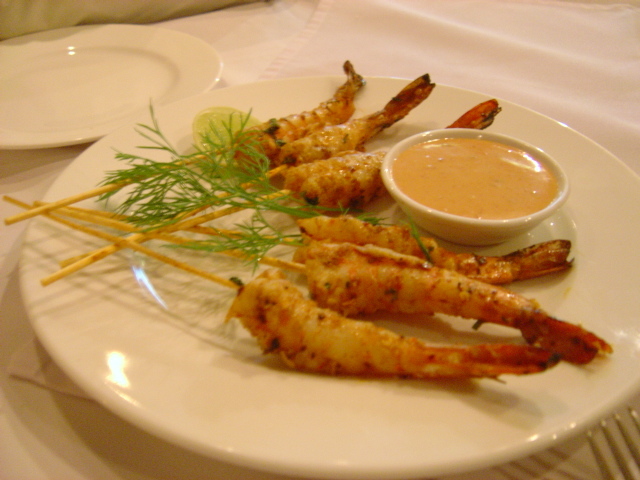 For instance, we specifically asked for the prawns to be brought in with our other entrees. They brought it before. Then they brought the drinks a good 10 minutes before the food. That’s criminal. 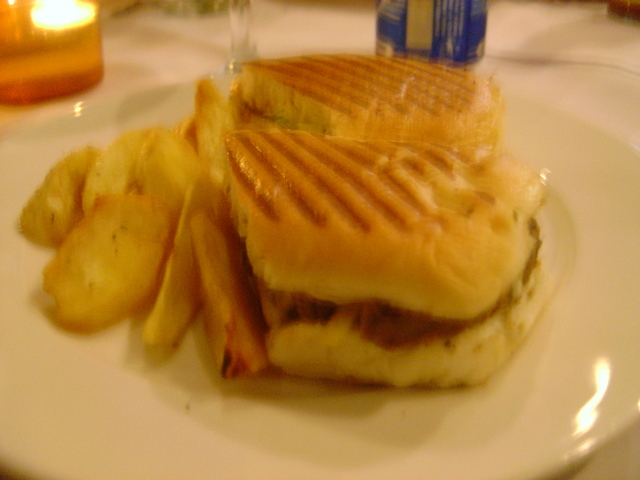 Then although we hadn’t ordered anything extravagant, just some sandwiches, it took them half an hour to prepare them! And that’s when there was only one other table occupied. What would they do if both their floors are filled to capacity? I reckon they know that’s highly unlikely, hence the lack of preparation for that eventuality. An amusing thing we found was the tiny-font statement at the bottom of the menu that said tables of six and above persons would be charged an extra 10% of the total bill, and that’s in addition to the 16% GST! I have yet to come across such stringent demands from a restaurant. Coming to the food, the Spicy Grilled Prawns were simply divine. They were grilled just about right and served with a sweet and tangy sauce. However, given the price of this chef’s special, they should definitely do something about the quantity. The Cheese Grilled Steak Sandwich had a fair amount of meat in it, but it was too rubbery and dry. When you order anything related to steak, you expect it to be tender and succulent. And if it is sizzling, all the better. This sadly wasn’t any of these things. 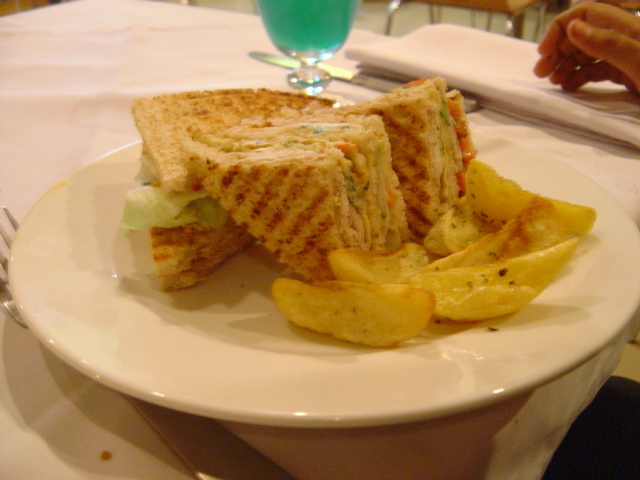 The club sandwich, fondly referred by them as ‘The Club’ was an amalgamation of chicken, beef bacon, turkey and what not. Unfortunately, none of these delicacies’ taste could be distinctly identified. But that wasn’t the main shortcoming. The fact that it was soggy was the culprit. Cold sandwiches although the main staple in the West, are not something people on this side of the world love to have. Subway had to learn this lesson the hard way, so now after filling their subs with the stuff, they bake it sparingly in an oven to make it hot, just what the locals like. The same predicament faces The Deli’s Club. Maybe if they can just bake it lightly after, the aroma of each ingredient would be aroused enough to arouse the stubborn olfactory buds of their clientele. Then there was something amiss in the presentation of both these entrees. For one, the whole thing looked sort of barren, with just the sandwich heaped on the plate along with a couple of potato wedges. They could at least have added some sort of salad (coleslaw like Gun Smoke) or a garlic sauce(like Indulge), anything to make the meal more sumptuous appearance-wise. Although taste-wise it wasn’t bad as already discussed, still when something looks appetizing, it enhances the taste subconsciously. 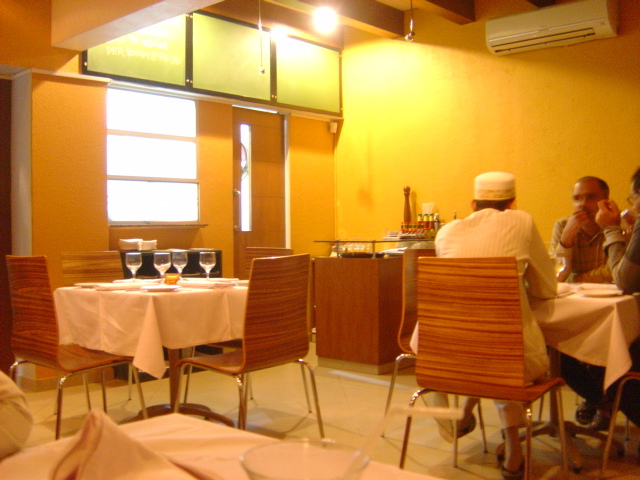 However, if you have a ravenous appetite, then your best option on Zamzama is Copper Kettle, Arizona Grill or Gun Smoke. Anything other than that, you’ll have to have a proper course meal complete with the appetizer and the dessert. But at these restaurants, you can expect to satiate your appetite by just the main entrée. 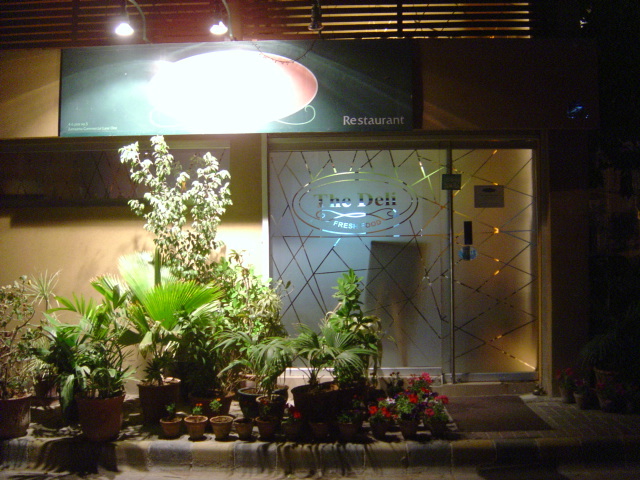 At the end of the day, there must be something great on offer at Deli which has enabled it to delude the fate of so many failed eateries at Zamzama. 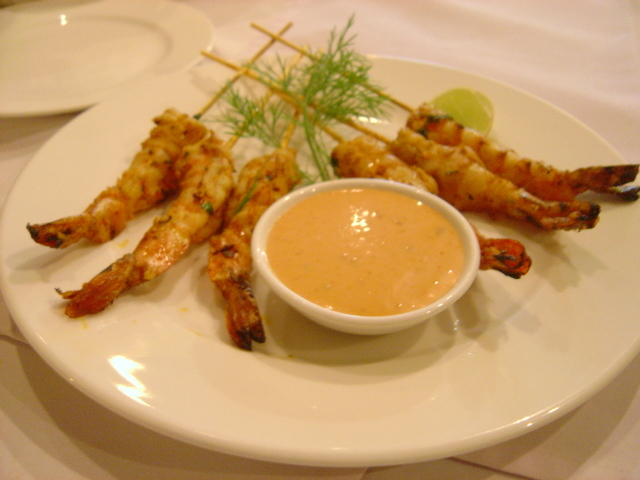 Maybe there a couple of scrumptious offerings like the spicy prawns we had which have helped Deli develop a faithful following, for there were a few families that came after us that looked to be loyal customers by their body language. However, there’s no doubt that Deli will have to work hard and long both on its offerings as well as marketing if it is to be counted amongst the top brands at Zamzama.